:O That's an amazing castle! Het dek op en neer! Al heen en al weer! Caernarfon has a few wooden floors still in place with some interesting exhibits, a nice one about Edward I's Queen - Eleanor of Castile. The crusades brought back a number of 'high tech' architectural techniques many of which were used in the building of the Iron Ring. Clearly when I visited it was a glorious sunny day (quite unusual for North Wales ) but I can imagine at night or wet overcast days many parts of the castle would be grim and foreboding. As a guard or servant at the castle you going to have to be fit to up and down all those stairs. Nice Build LP - had a sneaky peek around your flickr - man have you been busy - so great sets to delve into! Only had a skim as I am at work, looking forward to plumbing your miniature pictorial depths !!!!! So the interior floors were wood? 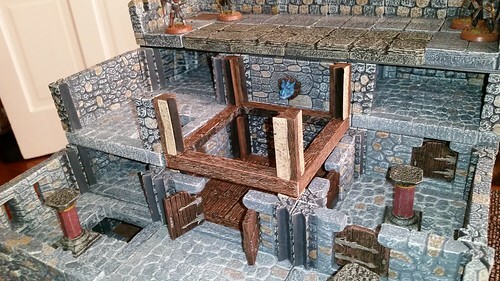 I wish that were possible with DF, have wooden floors on the interior of stone structures (and castles), especially for upper floors. Caernarfon is an awesome castle. I've been there several times, most recently this past April. One of the nice castles in Britain IMO. Apparently the angled towers and some of the other details were based on castle designs from the Middle East that the English rulers had been exposed to during the Crusades. The wooden bridge inside the tower isn't part of the original structure, it's something the restorers added in place of rebuilding all the floors in the towers in full. (In that photo you can see for example doors and fireplaces incongruously opening onto the open space beyond the bridge.) 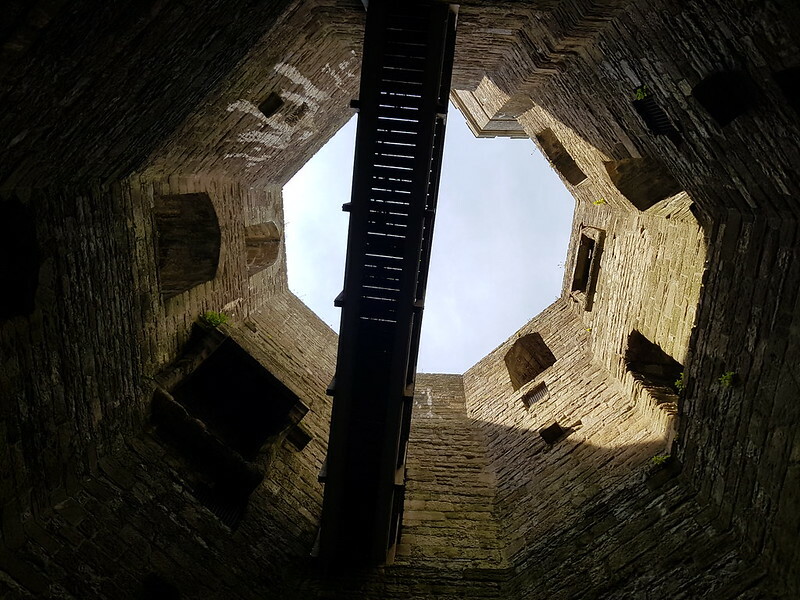 But I can certainly imagine a tower that did have such a bridge as part of the original design, leading above a prison pit or a cistern, for example. It's got a totally cool and rather creepy feel to it. Love the look of those walls, they have some nice multi-colored stones unlike some castles. I may borrow some of the look of these in my castle painting. That's it! I did not like crossing it. I toured Wales 16 years ago and was very impressed by this huge castle. Two things I remember were a tower that had a wooden bridge inside it and lots of high walls. Very picturesque. It is very impressive with tall thick walls in most places and some high towers, built to intimidate.